The two players to the left of the dealer put out blind bets. 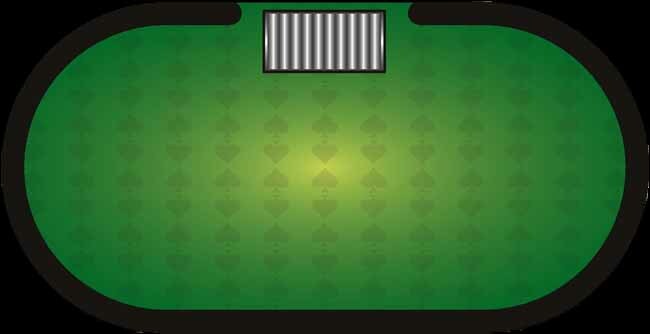 The player directly to the dealer's left puts out the small blind while the player two to the dealer's left puts out the big blind. Every player is dealt two cards, face down. These are called hole or pocket cards. The action, or the first move, falls on the player to the left of the big blind. She can either call the bet, raise it, or fold. Betting continues around the table, clockwise. After the betting is completed, three cards are dealt face up in the center of the table, which is referred to as the board. The first three cards in Texas Hold'em are called the flop. These cards are “community cards” meaning everyone can (and will) use them in combination with their own hole cards to make the best hand. From the flop on, betting begins with the player to the dealer’s left, who can check or bet. A fourth card is dealt face up onto the board. This is called fourth street or the turn card. Another round of betting. The final card is dealt face up. This card is also called fifth street or the river. A final round of betting occurs. The remaining players show their cards and the person who can make the best five card hand by combining their pocket cards with the cards on the board wins. Note: In some rare cases in Texas Hold'em, the five cards making up the board will actually be the best hand, in which case everyone left in the hand divides up the pot. As you will notice, the layout of the Texas hold'em poker table does not have any markings like other casino game tables. Most casino party poker tables hold 8 players plus the dealer. Before playing poker at a casino party or charity poker tournament, the first thing a poker player should learn is which cards are worth playing. Many beginners stay in with cards that have little or no chance of becoming a playable hand. Remember that no two cards alone are unbeatable, and once the flop comes out, cards that looked promising may no longer be worth playing. But to give yourself the best chance of winning, be patient and play only the best hands. Listed here are the strongest starting hands in Texas Hold'em. Other hands are playable depending on the table, but beginners may want to only play premium hands until they understand the game more fully. Playing these hands will not guarantee that you will win the hand but it's a good place to begin. High Pairs - Aces, Kings, Queens and Jacks. Pairs of 10's, 9's, and 8's are decent starting hands. Aces with a suited High Card - When you get dealt an Ace with a Kings, Queens, Jack, and even a 10 of the same suit, play them. You will have a decent high card. If the flush comes, you'll have the best possible flush because of your ace. 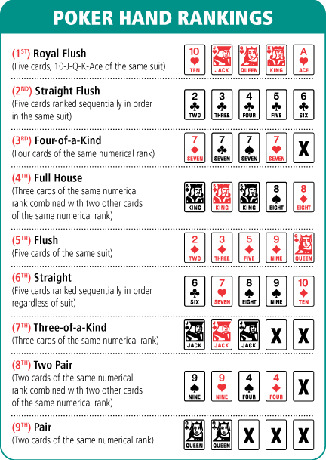 High straights and a straight flush are also possible with these cards. Suited Faces Cards and 10's - Suited face cards for the most part are playable hands. They hold a lot of potential including high pair with a strong kicker, straights, and flushes. Aces with an unsuited High Card - Aces with an unsuited high card can give you top pair with a high kicker or a high straight. Because there may be other players that also have an ace, the strength of your second card is important. If two players tie, the second card decides the winner. King with Face Card - A King paired with a Queen or a Jack isn't a strong hand but it is a playable hand. Two face cards rank high enough so that waiting to see the flop is a good idea. Royal Flush - This is a combination of the following cards of the same suit: Ace, King, Queen, Jack and Ten. Straight Flush - This is a combination of five cards of the same suit in sequence. Four of a Kind - This is a combination of four cards of the same denomination. Full House or Full Boat - This is a combination of three cards of the same rank and two cards of another rank. Flush - This is a combination of five cards of the same suit. Straight - This is a combination of five cards of different suits in sequence. Three of a Kind - This is a combination of three cards of the same rank, and any two other cards. Two Pair - This is a combination of two pairs of different rank and any other card. One Pair - This is a combination of one pair of the same rank, and three unmatched cards. High Card - No other hand combination exists. The highest card wins. If two or more players participating in the Showdown hold equal ranking hands, the high card will determine the winner. Should the Poker hands remain tied, the highest valued card not held in common determines the game's winner. In the event of exact ties in Poker hand values between two or more players, the pot will be split evenly between those players. If the pot cannot be split evenly among the players, the first winning player to the left of the Dealer will receive the extra chip. Experienced Hold'em players know what hands might be out in the hands of the other players at the table; they also know what hands aren't possible and they know not to worry about defending against them. Here are some simple guidelines to get you started in learning to read the table or board. Three of the Same Suit - is what you need for a flush. Sometimes when the suited community cards are not particularly impressive, you may tend to overlook the potential flush in another players hand. Sequence Cards - These are the cards that make a straight possible. If the cards on the board only have two 'holes' in a string of five consecutive cards, someone may be holding those cards and just may have that straight. When cards like 9-J-Q show up on the board, keep in mind that another player may be holding the 'missing' 10-K in their hand. In a game of limit poker, the amount you are allowed to bet is limited to a specific size. This limit is in the name of the poker game $1/$2, $5/$10, $10/20, etc. Keep in mind that you can't make a bet smaller than the big blind. Also, all raises must be done in increments of the betting amounts. In this game, there is no limit to the maximum bet that you can make in any betting round. However, the minimum bet is equivalent to the big blind. The minimum raise amount is at least as much as the previous bet or raise in the same round. There is no maximum raise; you can raise as much as you want. However, if you wish to call a bet but don't have the chips to cover it, you'll be 'all-in'. When you go "all-in" you will only win the portion of the pot covered by your chips. Pot-limit is quite similar to no-limit poker but there are certain key differences. In pot-limit poker, players may bet any amount from the size of the blind to the size of the pot. The pot includes the sum of all bets and raises made during the current round.